This sky map shows the locations of Venus and the Pleiades star cluster in the April 3 sky at 9 p.m. local time as seen by observers at mid-northern latitudes in 2012. As the bright planets Venus and Jupiter go their own separate ways after their spectacular tryst in mid-March, Venus continues to grow ever-brighter as the northern spring evenings warm up. The planet seems to gleam almost like a sequined showgirl, hovering in the west-northwest sky high above the setting sun. Many astronomy books refer to Venus as Earth's "twin sister," since both planets have very nearly the same size and mass. In terms of diameter, Venus is about 300 miles (483 kilometers) smaller than Earth and the gravity at its surface is 85 percent that of the Earth's surface. Of course, that's where the similarities end. The atmosphere of Venus is very thick and far greater in density than ours. Most of Venus' atmosphere is carbon dioxide, along with surface temperatures that are extremely hot; on the order of 860 degrees Fahrenheit (460 degrees Celsius). This high temperature is caused by the trapping of radiation by the lower atmosphere of the planet — a sort of runaway greenhouse effect. While our "sister world" Venus has attracted a lot of attention from its recent displays with Jupiter and a lovely crescent moon, come Tuesday night it will have a rendezvous with another noteworthy celestial landmark, popularly known in their own right as the "Seven Sisters" or the Pleiades. 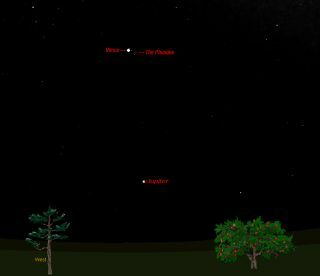 The sky map of Venus and the Pleiades with this story shows how they will appear on Tuesday. There is nothing else like the Pleiades star cluster in the sky. Few observers can look very long at the night sky at this time of year without noticing the Pleiades stars and wondering what they really are. The traditional Greek legend for the Seven Sisters — as this cluster has long been known — is that they are the daughters of Atlas and Pleione. Their father, Atlas, rebelled against Zeus, the king of the gods, who retaliated by sentencing him to forever holding up the heavens on his shoulders. This so grieved the sisters that Zeus placed them in the heavens so that they could be close to their father. Interestingly, widely separated and totally different cultures have always described the Pleiades as the "Seven Sisters," "Seven Maidens," or "Seven Little Girls." Yet, only six stars are readily visible to most observers. Those with more acute eyesight may glimpse up to 12 under good conditions. But why this cluster has been cited by more than one early people as having seven members remains a mystery. It will, however, be a bit more difficult to see them on Tuesday night, since brilliant Venus with its great brilliance will nearly overpower the star cluster. On that night, our sister planet will pass just a half-degree (the apparent width of the moon) to the south of the Seven Sisters. The planet is 160 times brighter than the star cluster. The very best views will be with binoculars or a small telescope, with Venus glowing like a steady white diamond below and to the left of cluster; a very beautiful sight indeed! In a telescope, Venus currently appears as a dazzling silver-white almost "half moon" phase, but in the nights to come it will gradually become a thick crescent while growing larger as it swings around its orbit closer to Earth. Watch as Venus changes it shape and size from week to week. If you snap an amazing photo of Venus and the Pleiades, or any other skywatching target, and would like to share it for a possible story or image gallery, please contact SPACE.com managing editor Tariq Malik at tmalik@space.com.